Into persecution, population control, births, and deaths, we are introduced Moses’ parents who are not named until the genealogy of Moses and his brother in chapter six. Moses’ father is named Amram, a descendant of Levi and he married his aunt, his father’s sister, Jochebed, in a relationship that God would later condemn. Where sin was found, grace was found in increasing measure. This union would preserve the future leader and redeemer of Israel. Moses' parents did not obey Pharaoh’s command, and they kept Moses safe as long as they could. They made special provision for him and constructed a watertight basket to hide Moses among the bulrushes of the Nile. Miriam safeguarded the basket in which her brother lay. Imagine the fear that gripped Miriam as the princess came to bathe and found the basket. On discovering Moses, she recognized what was going on, but was willing to bring Moses up under her guardianship and nursed by his mother. Moses’ parents exercised faith in God, believing that he was able to work out all things for them. It was faith that was tested by Pharaoh’s decree and God gave grace for this trial. Providence brought Pharaoh’s daughter to the right spot at the right time to find Moses in his basket. God’s timing and his methods are right. Who could have imagined that the Redeemer of God’s people would have been nurtured and trained in the palace of the very king who was oppressing them. The story abruptly moves forward forty years. During these years, Moses is instructed in the ways of the Egyptians, and he learns the history of his people. It is little wonder that the sight of an Egyptian beating a Hebrew made him angry. With no one around to see, Moses murders the Egyptian and hides the body. Trying to reconcile two argumentative Hebrews the following day, he is shocked to hear that they know of his crime. These circumstances force him to leave immediately. He goes to Midian and stays with the priest of Midian. One of Jethro's daughters becomes his wife. Another forty years passes before God sets Moses apart to do his work. 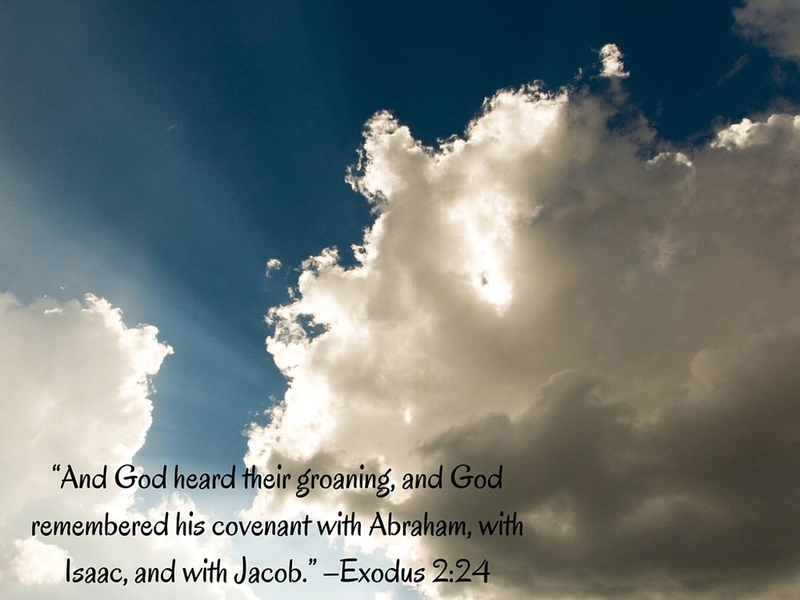 While Moses was gone from Egypt, the people of God were groaning under their burden but God heard their groaning, and he remembered his covenant. The promises he had made to Abraham, Isaac and Jacob, were the foundation upon which God’s intervention on behalf of his people would be built. God bound himself in covenant to his people. He loves his people. God is a personal God. He knows the needs of his people, and while men are plotting the ruin of God’s people, God is planning His peoples’ salvation. A Hebrew apparently marked for obscurity and poverty is destined to rise to be an unlikely prince before the world to show God’s power. Even enemies may be used to carry out God’s purposes. How should we look at the government?